In addition to high quality heating and air conditioning services, Affordable Air Conditioning and Heating offers a full range of expert ductwork services for residential and commercial HVAC (heating, ventilation, and air conditioning) systems, including ductwork repair and replacement. Ductwork is the "ventilation" in HVAC; it is the system of ducts, pipes, and vents that channel the hot or cold air from your central heating and air conditioning system into different rooms. Air ducts make central heating and air conditioning possible, but they can also positively or negatively affect the air quality, energy efficiency, and safety of your system. Having well-sealed ductwork helps your entire HVAC system run more efficiently, saving you money on utility bills. It can also improve your indoor air quality and ensure the safe operation of your system. At Affordable Air, we've been performing expert, affordable ductwork services in homes and businesses throughout South Orange County for over 30 years: we have the experience and expertise necessary to provide fast, effective results. To schedule your air duct repair or replacement, call Affordable Air today. As part of our mission to lower the cost of your residential or commercial HVAC system, we provide affordable, reliable ductwork repair and replacement services, including expert air duct sealing. Leaky ductwork can significantly increase the cost of using your HVAC system: when air escapes the ducts before reaching the rooms your system is attempting to heat or cool, the system then has to produce more hot or cold air to reach the desired room temperature. This increases energy use and utility costs, in addition to making your HVAC system less effective. Sometimes sealing or repairing ductwork is the most cost-effective solution for leaky ductwork. Other times, it will actually save you money in the long run to replace your ductwork rather than having to frequently seal or repair an old, deteriorated air duct. Our expert ductwork technicians have years of experience evaluating and repairing ductwork. They will quickly and thoroughly inspect your ducts and give you an honest, informed recommendation for the most cost-effective solution. While duct sealing is often a viable solution for leaky ducts, duct tape is never a good fix. Contrary to popular belief, duct tape is not an effective way to patch air duct leaks; special tape must be used, and in some cases, the leaky section of ductwork needs to be replaced in order to permanently resolve the problem. For affordable ductwork services you can rely on, call Affordable Air Conditioning and Heating today. 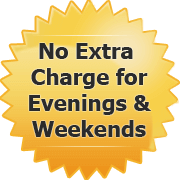 We serve all of South Orange County, and we offer convenient appointment times. We're happy to answer any questions you may have, and you're always welcome to speak directly with owner Paul Gillon, who has been installing and repairing ductwork since 1985. Affordable Air technicians are experts in air ducts and all their components. They're trained and experienced in sealing, repairing, and replacing ductwork of all kinds, so they can provide accurate assessment and fast, effective solutions for any air duct problem. See below for additional information about ductwork components and their functions. For more information, or to schedule a ductwork repair, replacement, or service, call Affordable Air today. Plenums: These ductwork components are responsible for moving the cold or hot air through your system's central unit, then circulating it to individual rooms in your residential or commercial space. Take-offs: Take-off fittings are small metal parts that attach to the main duct of your HVAC system and help direct airflow into the branch ducts, allowing the hot or cold air to be distributed to different rooms. Stacks: These vertical ducts help transport air in small spaces between walls. 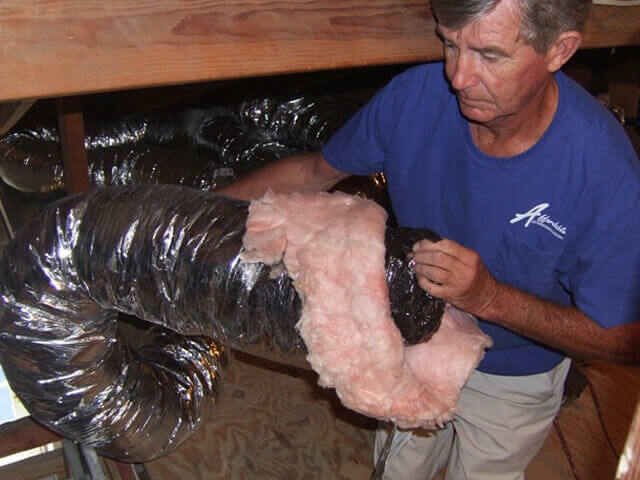 Insulation: Ductwork insulation helps keep the air traveling through your HVAC system at temperature. By retaining the heat or cold of your system's air, ductwork insulation helps conserve your system's energy use and optimize its performance. In addition to increasing energy efficiency and system performance, air duct insulation also absorbs the noise created by the airflow. Vibration Insulators: These flexible rubberized components absorb the vibrations and quiet the noise produced by your ductwork when hot or cold air flows through it. Smoke and Fire Dampers: These important safety components detect smoke and fire, then respond by automatically shutting off the airflow in your ductwork. This helps prevent the rapid spread of smoke or fire to other rooms. Our knowledgeable staff can answer any questions you have about the different types of ductwork, and offer expert advice about the best material for your HVAC needs and budget. Call Affordable Air Conditioning and Heating today for more information about the types of ductwork we repair and replace, or for any other information about air ducts. Metal Ductwork: Metal ductwork is the most common type used for HVAC systems. The sheet metal that forms the ducts contracts and expands with changes in airflow temperature, making this ductwork a strong and resilient option. It's also a versatile one; the sheet metal can be formed into rectangular ducts, round ducts, or even custom shapes. Pre-insulated aluminum ductwork is a popular choice due to its light weight and ease of installation. Flexible Ducting (Flex): Flexible ductwork is most often used to connect other types of ductwork. It is typically made up of wire coil covered by a plastic liner. These bendable circular ducts are more mobile and flexible than other ductwork, but they lose pressure more easily and are harder to repair. Fiberglass Ductwork (Duct Board): Fiberglass ductwork, or fiberglass duct board, is another popular choice for modern HVAC systems. This pre-insulated non-metallic ductwork helps retain hot and cold air temperature and muffles sound. It's also an economical option, and is available in different sizes.